Peripheryâ€™s â€œMarigoldâ€ is the anthemic lead single from their third full-length album, â€œPeriphery 3: Select Difficultyâ€. The song features a dark verse reminiscent of classical harmony, a foreboding and sludgy pre-chorus, and a titanic wall of a chorus that will both inspire you, and have you singing the hook after the first pass. We had the opportunity to sift through the various tracks of the song and take an in-depth look at Periphery's approach to "Orchestration In Heavy Music"! Misha Mansoor, Founding guitarist and head songwriter of Periphery, was kind enough to run us through some of his thoughts and methods regarding the writing and recording of the orchestral instrumentation in the song. 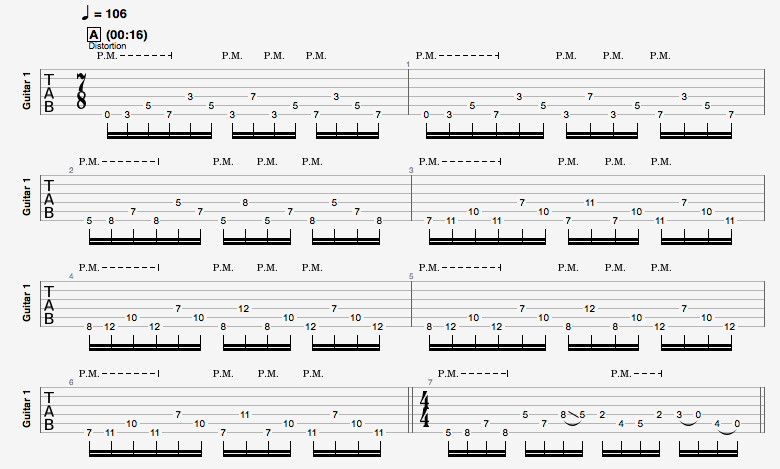 Weâ€™ll refer to this as the â€œMain Arpeggio Riffâ€. "It's funny because right before we started working on PIII, I was facing a pretty serious bout of writer's block. I felt like everything I was doing was just retreading the same ground, and nothing I was writing was making me particularly happy. I got into two things, however, that really sparked an incredible amount of inspiration: Synths and Virtual Orchestral Libraries. Marigold is actually a great example of the latter, as it was one of the first ideas I started working on where I was trying to implement full orchestration into the song." The first instance of the Main Arpeggio Riff here isnâ€™t actually the idea in its full musical capacity. The intro consists of a lone violin playing the core melody, which prepares the listener with a lighter introduction to the motif before we hear it in itâ€™s fully orchestrated form. Because of this contrast, the bands' entry following this small prelude has a very powerful effect. This first passage both establishes the motif of the song, and prepares our ears for a handful of new orchestration and instrumentation not necessarily associated with Periphery. This opening violin part is played with sharp, bouncing articulation known as â€œSpiccatoâ€. â€œSpiccato" uses the tension of the bow to seemingly bounce off the string, and often replaces "Staccato" (when stringed instruments are played at high speeds). Misha employs a great orchestral mixing/recording technique here that is colloquially known as "blending". "Blending" uses virtual instruments as the body of the orchestral sound, while also layering a live recording of the same part to add depth, intimacy, and a little bit of a human element. Itâ€™s a tried and true method used by top tier film and game composers, and, as Misha states below, can accomplish an amazing sound without breaking the bank. (If youâ€™re keen on reading a little bit more about blending, check out our last article on Protest the Heroâ€™s Caravan). "I was using Spitfire stuff on this song, Albion 1 if memory serves, and I just thought the library sounded not only fantastic but pretty damn realistic to my ears. However, I figured that it wouldn't hurt to see how a small section or even a single player playing a real version of the line would sound on top. Turns out, that sounds fantastic. You get the added bit of realism from the live performance mixed with the size and massive sound of the virtual instrument which is recorded by amazing players in an incredible hall. This was my "low budget" way of getting orchestration onto PIII without having to hire a full orchestra and orchestrator for my compositions. For context, that alone would have cost more than the entire budget of the album." "I had worked with Randy Slaugh in a very limited scope on PII, but here I have to say he had his work cut out. Not knowing traditional music theory or notation, I had to send him all my midi for every instrument/section and then he had to transcribe that to standard notation and then he recorded his players. He did a great job with that to where, when blended in with my programming, it's hard to tell what's what. I didn't use him for every section, as a lot of the orchestral parts that were in the full mix sounded great due to there being relatively less detail, so the exposed sections were the main focus. I believe he mainly focused on the string and brass sections, and especially the higher timbre/tuned instruments as those tend to be the ones that are tougher to recreate virtually. I remember for the intro of marigold, he said that he would have to hire an especially good violinist and most likely have to comp takes together as it wasn't especially playable, but that was honestly fine by me. I was going for sound without worry about how overtly playable an orchestral section might be. Doing this helped bring an added edge of realism and uniqueness to my virtual orchestra, which in turn helped PIII become one of the albums I'm personally most proud of." The second iteration of this arpeggio line is the Main/Verse. While itâ€™s not much of a melodic variation, as it is played in its original form on guitar, the instrumentation accompanying it is much richer than the solo violin we just heard. "Interestingly enough, the main riff/theme that opens the song was actually written as a guitar part, but I figured it must be somewhat playable on violin (not knowing anything about actually playing the violin). So I re-interpreted the second verse variation as an orchestral break, and that ended up being a lot of fun to work on. I also had the intro of the song start as a violin and flute. A lot of people don't like using woodwinds in more intense/modern Orchestral music, but I love seeing where I can get away with it because woodwinds are so heavily prevalent in JRPG music, like Nobuo Uematsu's music in the Final Fantasy series". The last variation weâ€™re going to look at is found in both the second verse, and after the second chorus. Melodically and harmonically speaking, itâ€™s a little different than what weâ€™ve heard. This variation outlines a different chord progression than itâ€™s original form. This time, moving in a more haunting chord progression than its first iteration. This â€˜hauntingâ€™ movement is largely characterized by its first movement of C minor to the D7 chord. A dark, and ominous harmonic choice. The violins are in their mid-range when playing this second verse variation, with some accented low notes in the low strings and newly added brass. These accents, similar to the flute from our second variation, outline a new melody underneath the flurry of violins sitting on top. Itâ€™s an interesting reversal in instrument arrangement from "Verse 1" ( high flute accents vs. low brass/strings accents). Once the section repeats, the violins start playing in their higher register and we get a bass drum/taiko drum introduction that adds new energy to the part. If you listen really closely, you can also hear a quick ticking sound, which adds to the percussive feeling and helps to create a sense of urgency. In the final chorus, Misha takes this idea for one last spin. The final lead of the song was written in a similar way to the "Main Arpeggio Riff", as Misha explains below, and establishes a familiar feel that touches on each major aspect of the song. "The arpeggios in the last Chorus were written as a midi violin line, and then doubled with guitar after the fact, which made them a bit challenging to play as they arenâ€™t entirely conducive to guitar. 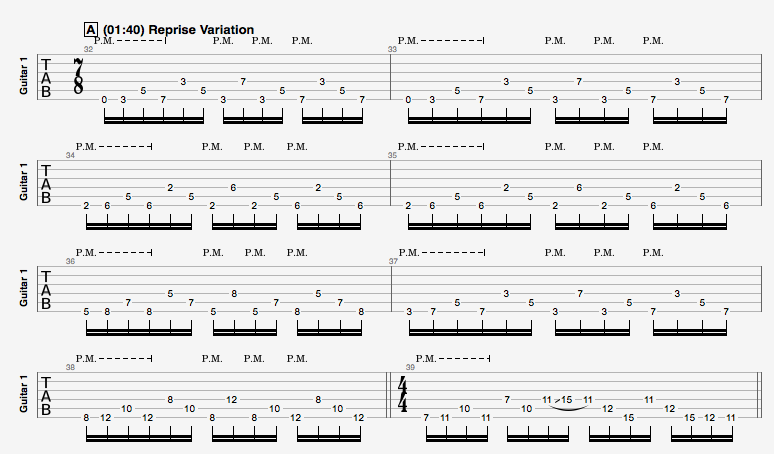 However itâ€™s a good way to step out of the box Iâ€™m in when writing guitar based arpeggios." This works to great effect in tying up the songs major musical ideas, and sending you off with a reminder of everything you've just experienced. Marigold is a great example of how much you can do with one musical idea (motif!). How you can manipulate music in ways that stay within familiarity but offer tremendous movement and effect. Within the genre of progressive music, itâ€™s very easy to move from idea to idea in effort of writing something unique. With Marigold, Periphery reminds us of what we can achieve with one musical idea, using instrumentation, orchestration, and a change of harmony. Reminds us of how to dig in and toy with our ideas in the musical sandbox.